In this part we will explain you how to add Social Link the the profile page of your users, so that your users can link one or more social network accounts to their existing account. 5. Add Social Link to the profile page of your users. The profile page is a page that is only available after having logged in on your website and can be used by your users in order to update their account settings. Update the template of the profile page and insert the following code at the place where you would like the social networks to be displayed. Make sure to replace #callback_uri# by the full url to the callback script created during the setup. The UI goal should be that users can easily identify that they can link their social network accounts to their profile on your website. The user_token is a unique identifier that you receive from our API whenever a user connects with Social Login or links an account using Social Link. The user_token uniquely identifies each user. For users that have never logged in with a social network account you might not have a user_token yet. In this case just leave the user_token empty to have our API create a new one. After having received a user_token from our API you have to store it in your oneall_user table and include it each time that you display Social Link to the same user. If you have finished setting up your account settings page then do a first test by clicking on one of the social network providers. 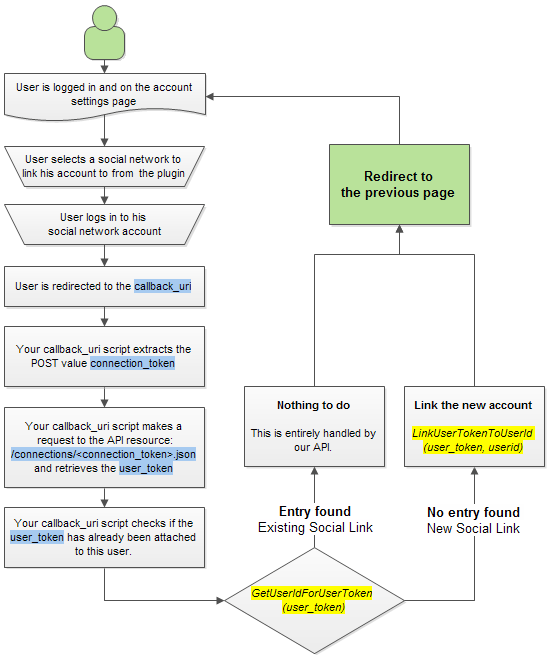 You should be prompted to login with your social network account, then be redirected to the callback_uri. The purpose of the callback script is to read the POST/GET value connection_token and to fetch the user's social network profile data by sending a HTTP request with that token to the OneAll API. In the first part of the guide you have added a basic callback script to test the Social Link integration. // Make sure we have received a connection_token. // Your OneAll Site settings. // The result is received as JSON. // Extract the essential data. // The handling depends upon the service. 7. Make a final test. Users should now be able to link and unlink social network accounts to/from their existng account. For your final tests you should first of all remove all entries from the oneall_user table. First link a a social network account on your profile page and make sure that your system populates the oneall_user table. The icon of the linked social network account should now be displayed with a checkmark on top. Then unlink the same social network account. The checkmark should no longer appear.